With the growth of the Internet and the ease of publishing content, a new era of creative minds has sprung up to share videos, music, software, products, services, opinions, and more. While the technology has empowered a generation, an unfortunate side-effect has been a culture in which some consumers of this content have provided feedback in a form that is personalized, mean-spirited, disrespectful, and in some cases, malicious. Unfortunately, this conduct can be jarring for many people, with some going as far to give up sharing their creative endeavors so as not to deal with the “wrath of the Internet”. Dealing With Disrespect is a short, simple to read, free book that provides a straight-forward guide for handling this kind of challenging feedback, picking out the legitimate criticism to learn from, and ignoring the haters. The book helps put all communication, whether on or offline, into perspective and helps you to become a better communicator yourself. The book is written by Jono Bacon, leading community manager and consultant, author of The Art of Community, founder of the Community Leadership Summit, and Ubuntu Community Manager. If you are involved with or running a community then you need to read this book. Seriously, it's a very down to earth no bull helpful, gentle guide in the right direction to dealing with a community on a daily basis. It is not a self help guide, it is genuine advice from an experienced community manager to other people in similar positions or those that just want to help make a difference. 5.0 out of 5 starsThis is an excellent offering. Jono Bacon has lived in the crucible in his many years as Community Manager for Ubuntu, so his advice comes from hard-won experience. This is an excellent offering. 3.0 out of 5 starsA good lecture. In my opinion provides a good overview of the communication framework. I wasn't very convinced by the writing style or my expectations were too high. Jono is a long time advisory of mine. And in the spirit of the school of Corleone's central teaching... "Keep your friends close and your enemies closer" it would safe for me to say that we have grown quite close over the years. This isn't just a book for people who need to fend off the trolls who have migrated out from under storybook bridges and now have taken up residence in every dark overpass along the internet superhighway. This book has useful information for anyone who finds themselves the quenching voice of dissent that balances the firey forge of passion, in the collaborative process of tempering an idea from something soft and malleable into something keen and durable, into something lasting and brilliant. If you find yourself struggling with providing constructive criticism and feel like people are just tuning you out when you speak up about something that is bothering you, you'll find some very useful information in this book to help you be much more effective in getting heard without burning bridges. Don't yell louder. Don't scream from the rooftops. Don't ratchet up the tension. 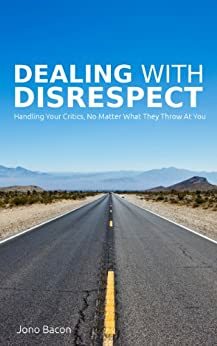 Read this book and learn some strategies to help prevent escalation and take an objective and calm tact at laying out your criticism respectfully. while working on the Ubuntu project. Personal, I see him as a friend, not a close one, but more like 'Brothers in Arms'. We share the passion of OpenSource and we do like Ubuntu OS, Heavy Metal and Pints of Beer. And especially we like to be a Dad of the most adorable and awesome Sons, we ever wished for. me back into the Ubuntu Business a couple of years ago, and I am very thankful for this. because I can be exact the same guy who he pictures in his latest book. from people who think they are the smartest guys on this planet. and sometimes speaks up, too loud. which is not really charming. aspects of how to read the different comments, responses or posts in our technical world. "The trick here is to determine the attributes of the sender and the context." Old Internet people like me, who still know the 'UseNet', we know how hard this can be. and we hit the 'Reply' button in our Newsreader and flamed this poor guy, we didn't even know personally. but, believe me or not, it also came back, like a boomerang, and it really escalated. But these were those days, we all had leather as skin, and we could swallow a lot. found on Weblogs and in the 'Comment' section of those or on Web-Forums. What and how we are saying, writing, commenting nowadays is more publicly exposed than 20 years back. conjugation of the word 'Good', even to say, that something was really bad. who are not socially well conditioned, people who don't speak the political correct english/language of choice. Now, Jono wrote exactly this missing guide. On how to deal with those people. And Jono just didn't write about it, he has the experience, working as 'The Community Manager' of Ubuntu. And he knows, that not all of these people are anti-social, hateful or disrespectful. Many of those people are smart, and in real life really friendly people. It just needs some experience to deal with them, and Jono gave us now the right guide to learn from it. I really beg you, to read this little guide of Jono, because you can learn from it. the rambling guy. It's worth a read. A lot to learn and to understand. This book finally tries to solve issues, which can't be fixed technically. Thanks Jono for this amazing guide.